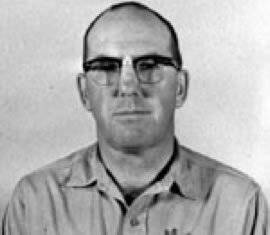 Officer Don Wagstaff was killed by an inmate at Point of the Mountain. The 56-year-old victim was supervising an early morning work detail at the prison dairy. When the victim discovered an inmate loafing, an altercation ensued and the inmate attacked Officer Wagstaff with a pair of hoof clippers. After beating the victim unconscious, the assailant bound his feet and covered him with grain causing him to suffocate. Taking the victim’s watch, wallet and coat, the assailant fled the dairy with another inmate. The two were arrested in a cab on Redwood Road a few hours later. The inmate was convicted of second-degree murder. He was paroled in 1983. Officer Wagstaff was married and the father of two grown children. He is buried in American Fork Cemetery. His bronze memorial plaque is sponsored by the Utah Department of Corrections.